The current report is only available to members and paying customers. Past issues become freely available online when the next report is released. Several individual sections of the report are freely available to download now (see below). Economic growth in the G20 and the eurozone peaked in the 3rd quarter of 2017 and has been decelerating ever since. 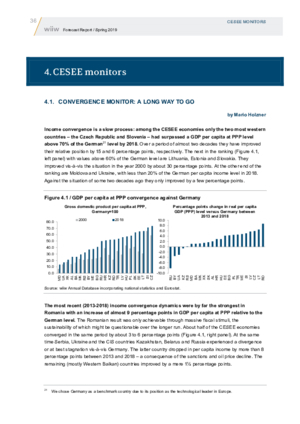 Slowdowns in China and Germany are particularly notable, and important from the perspective of CESEE. Global monetary policy remains extraordinarily loose, and is likely to remain so. 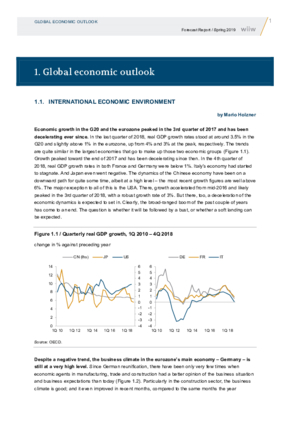 Despite increased global uncertainties – including Brexit, reduced global trade volumes and fears of a renewed euro crisis – our expectation is that eurozone growth will only decelerate slowly over the forecast period. 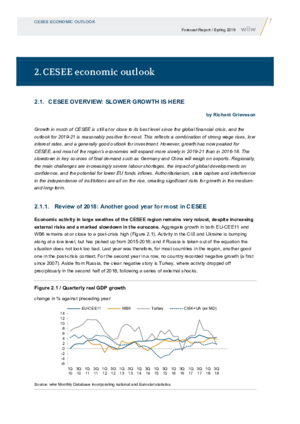 Growth in much of CESEE is still at or close to its best level since the global financial crisis, and the outlook for 2019-21 is reasonably positive for most. This reflects a combination of strong wage rises, low interest rates, and a generally good outlook for investment. However, growth has now peaked for CESEE, and most of the region’s economies will expand more slowly in 2019-21 than in 2016-18. The slowdown in key sources of final demand such as Germany and China will weigh on exports. Regionally, the main challenges are increasingly severe labour shortages, the impact of global developments on confidence, and the potential for lower EU funds inflows. Authoritarianism, state capture and interference in the independence of institutions are all on the rise, creating significant risks for growth in the medium and long term. 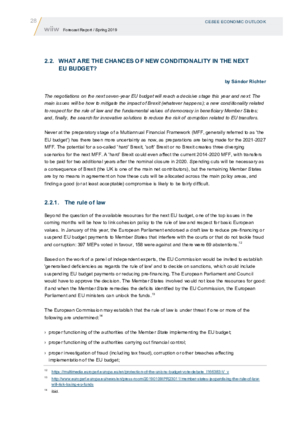 2.2 What are the chances of new conditionality in the next EU budget? The negotiations on the next seven-year EU budget will reach a decisive stage this year and next. The main issues will be how to mitigate the impact of Brexit (whatever happens); a new conditionality related to respect for the rule of law and the fundamental values of democracy in beneficiary Member States; and, finally, the search for innovative solutions to reduce the risk of corruption related to EU transfers. 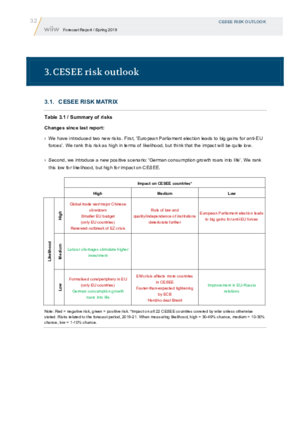 Downside risks to the economic outlook in CESEE are high, reflecting a potentially volatile mixture of regional and global factors. For the region as a whole, we are most worried about higher US tariffs on EU exports, and the spillovers from a re-emergence of the eurozone crisis. Romania has posted the best convergence performance over the past five years, but this was only achieved through massive fiscal stimuli, the sustainability of which might be questionable over the longer run. Over the same period, Serbia, Ukraine, Kazakhstan, Belarus and Russia posted the worst convergence performance, experiencing at best stagnation relative to Germany. 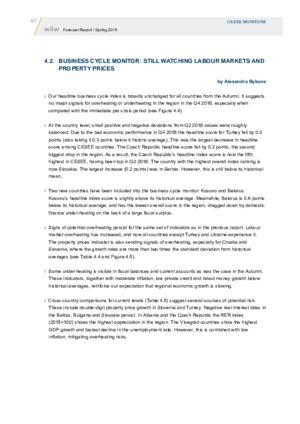 Across the region, potential overheating remains most evident in tight labour markets, higher external debt, elevated property prices, and negative real interest rates. In this context, inflation remains notably weak. Household credit growth remains generally much stronger than that to corporates, although the latter is picking up in most places. Asset quality has improved significantly almost everywhere. 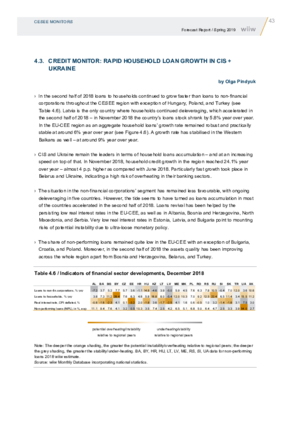 Potential concerns include high household credit growth in the CIS + Ukraine, and negative real interest rates for the eurozone countries and some other parts of EU-CEE. FDI inflows into CESEE fell by an estimated 9% in 2018, mostly on account of Russia, where inflows dropped by 35%. EU-CEE11 received about 4% more FDI in 2018 than the previous year, largely owing to fewer disinvestments in Poland. 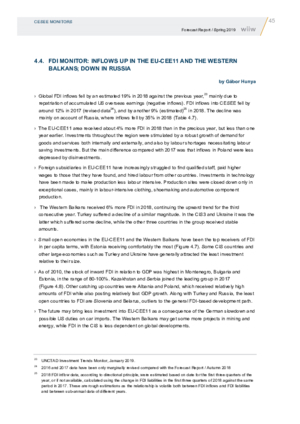 The Western Balkans received 6% more FDI in 2018, continuing the upward trend for the third consecutive year. Quantitative easing undertaken by the ECB was supposed to provide liquidity to the banking sector, in order to make it easier and cheaper for banks to extend loans to companies and households. 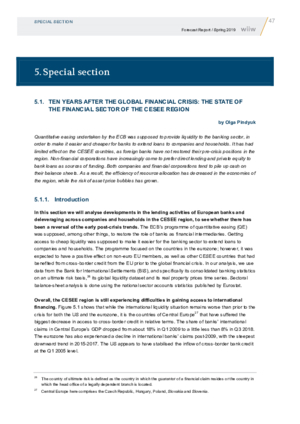 It has had limited effect on the CESEE countries, as foreign banks have not restored their pre-crisis positions in the region. Non-financial corporations have increasingly come to prefer direct lending and private equity to bank loans as sources of funding. Both companies and financial corporations tend to pile up cash on their balance sheets. As a result, the efficiency of resource allocation has decreased in the economies of the region, while the risk of asset price bubbles has grown. Growth in much of CESEE will remain healthy by post-crisis standards, but has passed its peak. We expect most economies to slow from here, reflecting weaker external demand and domestic capacity constraints. 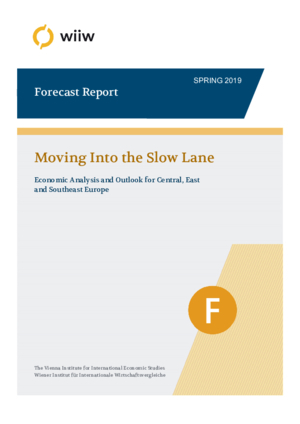 Global trade tensions, structural weakness in the eurozone and Brexit all pose downside risks to our forecasts.